I cut my teeth in India with luxury travel, moving up a notch, with my second company, to super luxury travel. But then I got bored of being pampered and not seeing the real country, being cossetted from the reality of the country and its people. Since then I have spent several years living here and love getting out and about and meeting the real people of the India. I do appreciate that all people are ‘real’ but I mean meeting people from ground roots up, the heart and soul of what makes this country tick. Here are my favourite encounters from this month, stolen from my FB posts (sorry!). They involve a taxi driver, a tuk tuk driver, a chai wala, a restauranteur and of course, this being India, a cow. The Longest Serving Taxi Driver in Delhi? Last night, rather later and not quite as sober as anticipated, I asked the establishment of my choice to order a taxi for me. Being quite a swanky place I was delighted when a battered, old, original black and yellow ambassador turned up. But this was no ordinary battered ambi, no! This one was driven by Dr Taxi Driver Sahib (His official title according to his business card) who has been driving cabs in Delhi for over 40 years. He delighted in showing me his award at having being voted Delhi’s best taxi driver back in 1982 as well as his album of pictures of the people he has driven over the years which includes the owner of Karma Cabs in London, Amitabh Bachchan, Rahul Gandhi and now of course, me. He then showed me his book of thanks with notes written about his services by his clients going back, well, over 40 years. 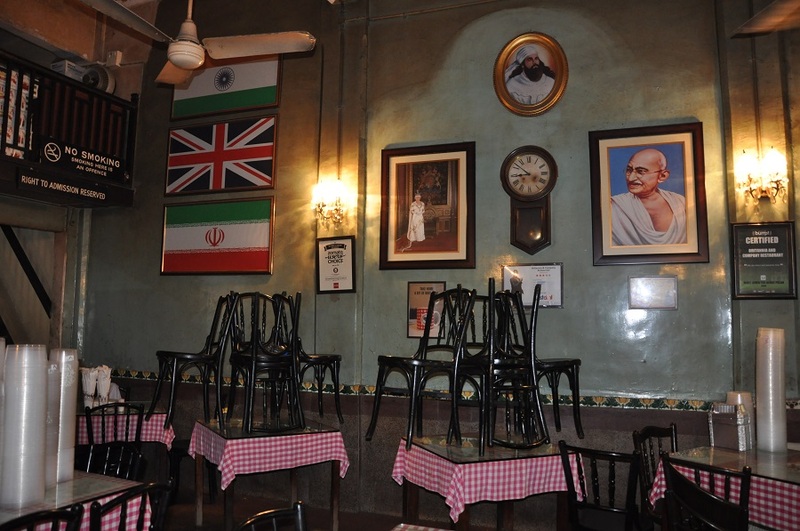 On exploring the fort area of Mumbai (on foot of course), among other many amazing things, I came across the utterly fabulous Britannia and Company Cafe which specialises in Iranian and Parsi food. Initially set up in 1926 (when there was still direct access to the water front which was closed off after Independence) by his grandfather, it is now run by Afshin Kohinoor and his father Boman. This is one of those wonderful old institutions which are now sadly dying out. They weren’t open as they no longer offer breakfasts, but despite that, he waved me in, allowed me to take as many photos as I wanted and then invited me in for a chat. He ordered me a chai from the next door chaiwala and told me about his dreams of selling up and opening a cafe in London, ‘Just like Dishoom,’ he told me. His father though won’t hear of it and although one shouldn’t want to stop someone from following their dreams, it would be a huge shame to lose this institution from Mumbai. Surrounded by decor more akin to a Parisian restaurant, I forgot about my other sightseeing as we chatted for over an hour. He had his pet dogs behind the counter, had fascinating stories from his 40 years in the cafe, and the food – he slipped me a creme brulee – was to die for. There was no question of me paying, I was his honoured guest. Their 99 year lease is up in two years and it sounds unlikely that they will continue to trade beyond that, he now only opens Mon – Sat from 1200-1600, visit now before its too late! 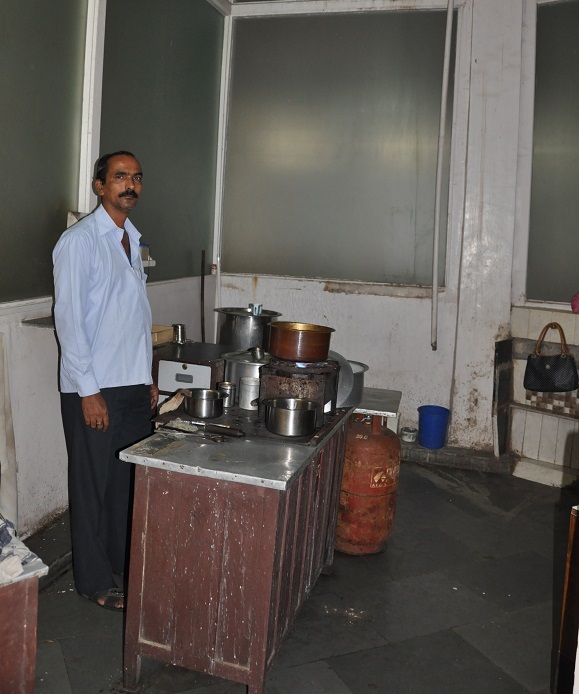 The chai stall servicing The Britannia Cafe was run from the second floor of the next door building by two (rather scruffy looking) brothers and this is where a little bit of Hindi goes a long way. I asked (in HIndi) where they were from, interested to see whether or not they were local but no, they came from Dungarpur in Rajasthan. They were astonished that I had not only heard of it but had been and with that, the connect was made and they allowed me into the ‘closed’ building to see the space they work from. Up we went in a lift dating back to the 1890’s with the pull across metal grate, watching the damp walls creep by, to see a small room, with one stove (not a chair in site) and from where they serve 1500 cups of chai which they hand deliver 2 – 3 times a day, to the surrounding offices. Don’t be fooled by the scruffy attire, they charge Rs15.00 per cup. I did the maths and I think I am in the wrong job! My journey home from work involves being dropped off part way, from where I have to cross a four lane highway, though of course, this being India, four lanes can be as many as seven or eight. This is also, just to add to the chaos, at the site of some metro construction, and by a temple. There is a man posted at this location to help you cross. A more futile job I never came across as armed merely with a red flag and a whistle, which quite frankly stands no chance against the blaring of the horns against the attitude of the Indian driver, he doesn’t stand a chance. All day, every day he gamely ventures out into the traffic waving his flag and blowing his whistle. Barely anyone pays any attention to him and on several occasions I have seen politicians, army and police just carry on past him as I and my fellow road crossers rely on safety in numbers to forge our way across. Occassionally I venture across on my own, my white face causing enough of a shock for people to at least slow down, they certainly will never stop, and testing my reflexes and intuition to the limit, perfecting sprint starts and sudden stops, so far I have been successful. But one day last week, the flag man was on the far side of the chaos, and as I was standing waiting for what seemed like an age for an opportune moment, a cow came out of the temple, without so much as bothering to look (sounds crazy but street dogs do know how to cross roads here!) and with the road confidence that only an Indian cow can muster, it strolled straight out into the road. Every car stopped instantaneously, on he carried, up and over the central reservation (another hurdle I forgot to mention) and, all cars having screeched to a halt on that side too, made it safely across the other side. I was so engrossed in the spectacle, that I missed my opportunity to join him, thus gaining a safe passage. It then took me another three full minutes to negotiate my own way across. Such is life in India. A tuk tuk driver and perceptions – misplaced sympathy. On leaving Khan Market, and wondering where I could get a taxi from, I got chatting to a group of tuk tuk drivers who were drinking chai. Naturally I joined them and then agreed to a lift home with one of them. He proudly pointed out his ‘We Respect Women’ slogan inside, above his (never used other than for hair combing) rear view mirror, and his vibrant pink leatherette seats. I soon discovered that is was from Madhya Pradesh, my favourite state of India which is home to several tiger reserves (one of which I spent 8 months in). It is stunningly beautiful and has abundant wildlife, yet he didn’t even know that there were even tigers there, never mind having heard of Bandhavgarh or Kanha. As I was pondering the fact that he had never witnessed the stunning natural beauty of his own country, he proceeded to give me the run down on the abilities of every cricketing nation globally. Pakistan, Australia and South Africa were his top three and England were definitely, most definitely, bringing up the bottom of his list. I may have felt sorry for him not knowing about the tiger reserves, but that was nothing compared to his reaction when I told him I was English. It was as if he wished he could have changed my national identity for me, ‘Oh madam, very bad, English, no good cricket, very less team’ he said with a very grave and despondent head wobble. To him, it seemed my life was no longer worth living and I received nothing but sympathetic glances for the rest of my journey home. On a final note, The Britannia Cafe is located in Wakefield House – I am from Wakefield, I wonder what the connect is. I know the architect was British I wonder if was from Wakefield or was called Wakefield or neither? Charmingly hilarious post… at least parts of it are, and the rest doodles an image of India that India really needs. Mumbai – its expensive! 🙂 I daren’t tell you how much the Taj charged us for tea and cake, criminal! I always enjoy reading about my beloved India. Can’t wait to return – hopefully soon!